With its seemingly complex play of colorful diamonds and diagonal lines, our Tiny Tile Quilt may give the impression of expert quilt making, but the reality is simply squares… lots of them! 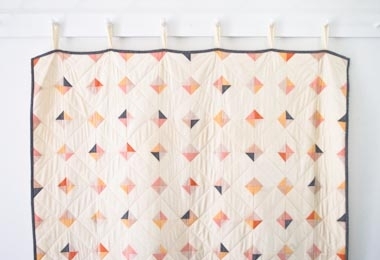 Our Tiny Tile Quilt Bundle includes all the fabric, batting, and thread you'll need to make a 50 x 60-inch quilt in the same soft and cozy cottons we used and in our palette of fresh blossoms and fruity sorbets. Please click Product Details, above, to learn everything that's included in this kit.